It is my pleasure to tell you about my experience with my German Shepherd Dog, Kaylee. My sweet little Kaylee was six years old when I took her into my home and my heart. Of all the pets I have ever had, Kaylee was by far the smartest. Kaylee was also sweet and had a good heart. However, my experience with her was not a positive one overall. I had been looking for a GSD for some time. I heard about Kaylee through a friend of a friend. Her owner was moving out of state and couldn't take her with him. His heart was broken and he wanted to find a good home for her. So Kylee moved in with me. Sadly, there were problems from the beginning, many of which were not Kaylee's fault. I hadn't had the opportunity to spend much time with her before she had to come live here and she knew so many things that I didn't understand. She tried so hard to communicate with me but I didn't know what her "signals" meant and this made her tremendously frustrated. Turns out I wasn't told the whole truth about Kaylee either. Oh, they told me how sweet and smart and protective she was. What they failed to tell me was that, with Kaylee living with me, nobody else would be able to come into my house. Kaylee was fine with new people if she had the opportunity to meet them outside but she wouldn't let anyone in the house except me. For the six weeks I had her, nobody else was able to come into my home. While I found my time with Kaylee to be very frustrating for me as well, we did have a good deal of fun. She loved to play catch and we did that a lot. Every night, Kaylee would wait in the doorway of my bedroom to be invited in. She would settle down next to my bed and remain there until morning. walk her. Kaylee was also not good with other animals. Anything that would run from her, she would chase. She barked at my neighbor's cows and chased my cats, who could no longer come into the house because of Kaylee. After six weeks of a great deal of trying times, not the least of which was not being able to have any company, I made the heartbreaking decision to take Kaylee to an excellent facility where she would hopefully be retrained and found a new home. I took all of her favorite toys and her favorite food (Kibbles 'n Bits Original mixed with Alpo canned was her preference). Her football, tennis ball, and teddy bear went with her. I deliberated long and hard before coming to that decision. My other alternative was to keep Kaylee in an outdoor kennel, and that would have broken her heart as she was a "people dog" - or rather a "one person dog." At the shelter, they evaluated Kaylee and I was told that whoever gave her to me was not honest about many of her traits, including being aggressive, overly protective, territorial, and a threat to children and other animals. Upon relinquishing Kaylee, I had to sign papers stating that I understood that I would not be permitted to know what happened to her. However, I would imagine that she was determined to be "not retrainable" and was euthenized. I am sharing my story about Kaylee because it was me who failed her. Kylee did nothing wrong, she didn't fail, I did. I am an animal lover and I know better than to take in a strange dog. I thought I was helping her but I wasn't and I didn't. The look on that sweet dog's face when I shut her in a kennel and walked away will haunt me forever. I have given up my dream of having a German Shepherd. After Kylee, I just can't. She had the biggest heart, she was so smart, she tried so hard. If one person learns from the stupid thing I did, it is worth sharing my story. What a Beautiful face and her Beautiful expression!!! Hopefully she has another home with loving people. When I read your story, I was a angry and felt you did fail her. But, I am not going to judge you. You didn't get her till she 6 years old and that does make a difference on how she was raised. It sounds like she wanted to be the boss and not you. Dogs need to who is the "boss". Six weeks is a short time and if you had spent more time with her before giving her up, you probably wouldn't have lost out on the most unconditional LOVE you would have experience by a German Shepherd. You said she wasn't good with children and that is scary, I wouldn't want some little child or anyone to get seriously hurt. I have Mia, my Beautiful German Shepherd, she is 2yrs old now, she was 12 weeks old when I got her and she is something else. We Love her so much but she is not the boss, I am and she knows that. She is so smart and a great Protector! Maybe one day you can forgive yourself and get a German Shepherd puppy and experience what German Shepherd owners/parents experience everyday; Loyalty, Devotion, Companionship, Playfulness and Protection. We love all animals especially big dogs like German Shepherds. Join in and write your own page! It's easy to do. How? 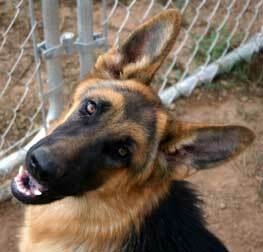 Simply click here to return to GSD Rescue stories.